This is one awesome spot! 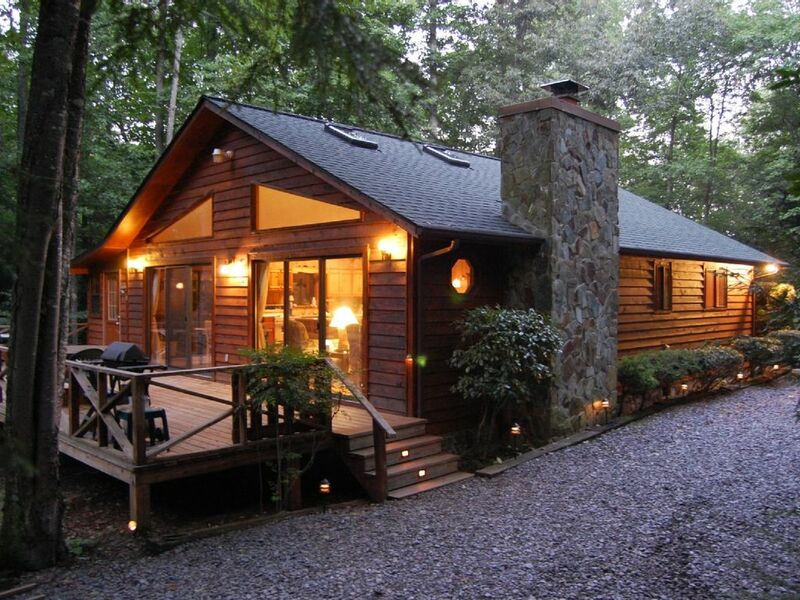 Your cozy cabin is located alongside a meandering creek in the Smoky Mountains near Murphy, North Carolina. Our priority is to provide extra clean and comfortable accommodations. All amenities are included to make your stay a relaxing and memorable experience plus internet access ~ WiFi. The cabin is set on three wooded acres that encompass both sides of the creek. A trail runs along the back of the property and parallels the creek. This path is great for walking or hiking and makes for easy exploring all the way into the community park, where two creeks converge with small waterfalls. The creek is great for the kids and adults alike to splash, swim and explore. Check out the guests 'Reviews' of this property. We spent over a year searching for the ideal location in this area of the Smoky Mountains and found it here at Persimmon Creek Cabin. The property is 3+/- acres and our creek runs through the middle of the property just below the cabin. Unlike most of the other properties we previewed, it's very private here in that you cannot see any other cabins from here! This cabin is located in a picturesque community of upscale homes which are spread out with 3-4+ acres of thick woods in between. This provides lots of privacy and solitude yet it's easy to get to and not way out in the boonies. Private setting - you cannot see any other cabins from here. Yet it's not isolated and out in the boonies. The creek runs just below the deck and meanders through the middle of our 5.5 acre property. Open concept floor plan in great room with skylights. Spacious work space with lots of counters and eat in kitchen bar. All porches overlook the rushing creek. Both decks overlooking the rushing creek. There is a community swimming pool in the town of Murphy at Konahetee Park. About 15 minutes drive. Enjoyed sitting on deck with sounds of creek. Cabin clean, nice , well stocked and very comfortable. Great location. Beautiful, relaxing vacation spot. We did not want to leave! We spent each day hiking and would return to the cabin for a fire to relax and unwind. Can’t wait to go back! I don’t really know what to say anything more about the cabin. We really liked the location of it. It was very near Blue Ridge area and Ocoee river Tennessee and ruby falls. Great family getaway, nice place to disconnect. We loved the fire place and beautiful creek below. Good location not far from things to do. This cabin is well stocked, clean and comfortable. My family enjoyed the privacy and the sounds of the creek close by. The location is great, close to Murphy and Georgia and Tennessee. My mother loved that the driveway is not steep, very easy to access with any type of vehicle. The owner made sure that we had everything we needed for a comfortable stay. I would recommend this cabin. Be sure to check the owner’s directions before you get to Tilson Rd. His directions work better than GPS. Persimmon Creek Cabin is private and secluded, yet is conveniently located near the town of Murphy. Here along the quaint main street and square you will find many cafes, restaurants, and shops. The town is reminiscent of days gone by and is a great place to walk around. On the outskirts of town you will find a variety of grocery stores, home improvement stores, and too many other retail outlets to list. There are many activities easily accessible from the cabin, including: White Water Rafting ~ Trout fishing ~ Fly fishing ~ Guided Fishing Trips ~ Golfing ~ Hiking ~ Family River Tubing ~ Antiquing & Shopping ~ Horseback riding ~ Bowling ~ Scenic Railroad Train.